This week I've launched the Kickstarter for my new website, Bellingcat, which I hope will solve one issue I've come across again and again. Often I've been invited to various events where people who have developed great tools and techniques for working with open source information have spoken in front of a crowd of eager journalists, activists, researchers, etc, who listen to the presentation, then go home and forget about it. With Bellingcat I'm trying to do something that will keep those people engaged with those tools and techniques, and also show others how to use them. Bellingcat has contributors writing for the site on a variety of subjects, but all using open source information for their work. Over the last two years I've used open source information to investigate the conflict in Syria, but it's not just about conflict zones, with the OCCRP demonstrating the use of open source information to investigate cross-border crime and corruption. I want to engage Bellingcat's contributors with the tools and techniques organisations like the OCCRP have developed, but also teach others how to use them. Along with news and analysis, Bellingcat has guides and case studies so anyone can learn the same techniques we've used in our investigations, creating new investigators. We also plan to have ongoing projects which Bellingcat readers can get involved in, learning about tools and techniques while contributing to the projects in a meaningful way. In the coming weeks I hope to provide information about these projects, and how Bellingcat readers can get involved. Bellingcat is as much about the readers as it is the contributors. We only have to look at what's happening with Ukraine and Gaza to see why it's important to understand open source information and why verification is important. If you agree, then please donate to the Bellingcat Kickstarter. Update - The Bellingcat Kickstarter is now live, with more details on Bellingcat. Donate £5 or more to get access to the Bellingcat website, with exclusive content and podcasts. I have big news to announce. I will be launching a website called Bellingcat. As a champion of open source tools, I cannot imagine bringing this website to life in any other way than appealing to my community of supporters who have brought me to where I am now. So, we will be launching a crowdfunding campaign on July 14. Bellingcat is a website that triumphs the power and potential of using open source information. 1. It will bring together a group of writers and activists who through using open source tools have transformed journalism and solidified themselves as experts in their fields, such as (might already be familiar with these great people): Peter Jukes; my anonymous phone hacking contributor; Jonathan Krohn; Phillip Smyth; Aymenn Jawad al-Tamimi; and more. 2. It will be a place that will attract others to come and learn how to use these same tools, techniques, and processes. Bellingcat will include how-to guides, case studies, articles, and other media such as webinars on the latest tools and technologies, which will aid others in becoming citizen open source investigators. For me, Bellingcat is about giving other people out there, just like me, a chance to learn what I've learnt over the last two years by trial and error in one place, making it as easy as possible to investigate the things they are passionate about. I also want to help support the people who are already doing the same kind of work on a variety of subjects, and get them involved with the opportunities I'm presented with on a regular basis— new technology projects, contacts with all sorts of organisations and individuals who could benefit from their expertise. I welcome any of your ideas for the crowdfunding page. The success of this open source endeavor relies on participation. YOUR participation. Please join me in making this a reality. To be part of the Bellingcat mailing list, sign up here. You can also follow Bellingcat on Twitter. Please contact brownmoses@gmail.com with any media queries. The name of this group translates to “The Honored City’s Brigades.” Its origins lie in the days of the Sunni insurgency of the Iraq War, though it is quite clear that it was an independent group. 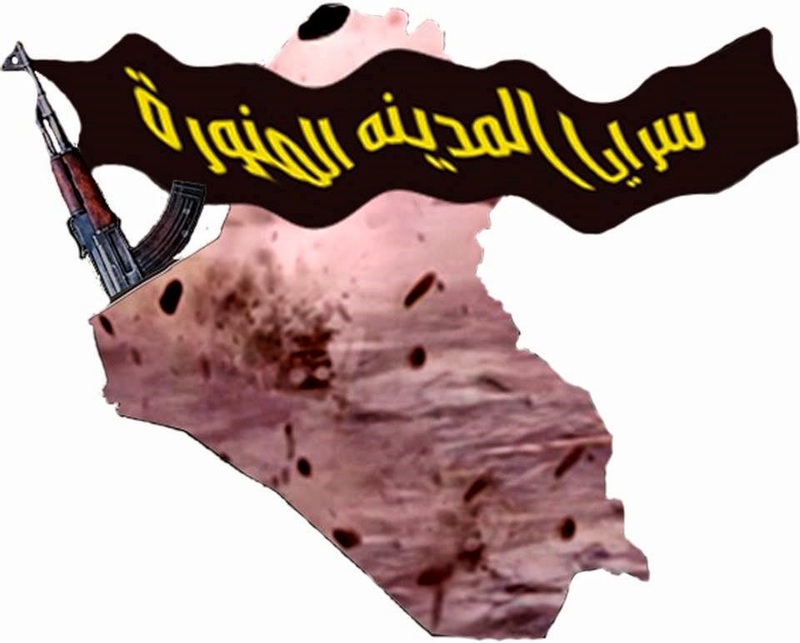 For example, in this posting from September 2007, it is identified as one of the “jihadi groups not rallying under any front,” contrasting with, most notably, the “Islamic State of Iraq” umbrella that included al-Qa’ida in Bilad al-Rafidayn. Like the Jaysh al-Mujahideen, Saraya al-Madina al-Munawara has begun advertising its military activities more openly on social media with the revival of the broader Sunni insurgency since the beginning of this year. To be sure, the media representative’s claims of secrecy post-American withdrawal in 2011 explain the lack of media material demonstrating a supposed presence within Syria. A contingent fighting in Syria hardly comes as a surprise if true. Tying the Iraq and Syria struggles together is not solely the preserve of the Islamic State of Iraq and ash-Sham (ISIS), but also articulated by ISIS’ rivals in Jamaat Ansar al-Islam (which has ideological affinity with ISIS and has openly deployed a contingent to Syria), the Islamic Army of Iraq, and Jaysh al-Mujahideen. However, unlike these aforementioned groups, Saraya al-Madina al-Munawara does not see itself at odds with ISIS, as indicated to me in the interview in response to a question I posed on relations with ISIS: “Our program is the book [i.e. the Qur’an] and the Sunnah. We have no disagreement with any of the mujahideen. Our aim is the establishment of justice and a rightly-guiding Caliphate.” At the same time the representative expressed hopes to me for unity among the insurgent groups, saying that if such unity were achieved, they could reach Baghdad “within days.” The testimony thus related points to a clear Islamist outlook, though the open-source discourse does not place emphasis on establishing the Caliphate in the manner stressed by ISIS and Jamaat Ansar al-Islam. An instructive case-in-point is the local Mosul franchise for the General Military Council (GMC), which is a front group for the Ba’athist Naqshbandi Army (JRTN). With the Mosul branch having previously hailed ISIS as “lions of the desert,” the GMC recently released a statement on the fall of Mosul in which it claimed that “the rebels of Mosul in all their factions- by God’s preference- seized complete control of the right side of Mosul [i.e. 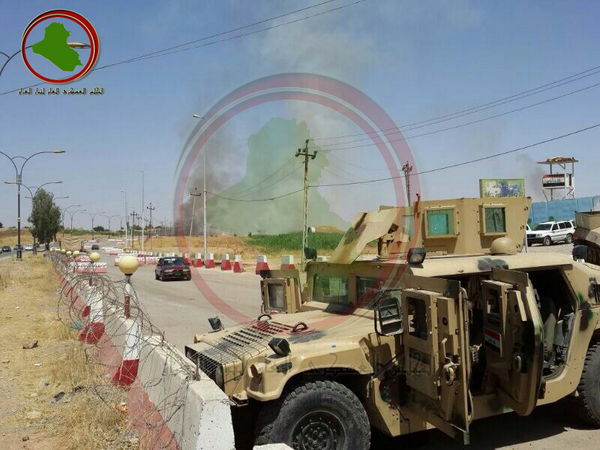 the side west of the Tigris River]…and all the political and security leadership fled.” The GMC also released some photos showing capture and destruction of Iraqi army equipment in the wider Ninawa province. 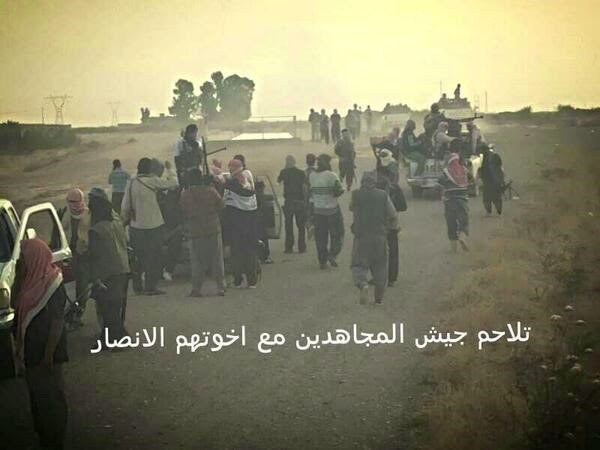 Though there is good reason to be skeptical of the GMC’s claims to have participated in the takeover of Mosul in light of past stealing credit from ISIS for new insurgent offensives launched in Anbar province (most notably in al-Zuba’ and al-Karma, with the record subsequently clarified in ISIS’ favor here), two conclusions are to be drawn here: first, neither JRTN nor its front groups wish to confront ISIS, regardless of true feelings towards ISIS, and second, other groups are clearly exploiting the vacuum created by the ISIS-dominated takeovers of new areas in Ninawa, Kirkuk and Salah ad-Din provinces. 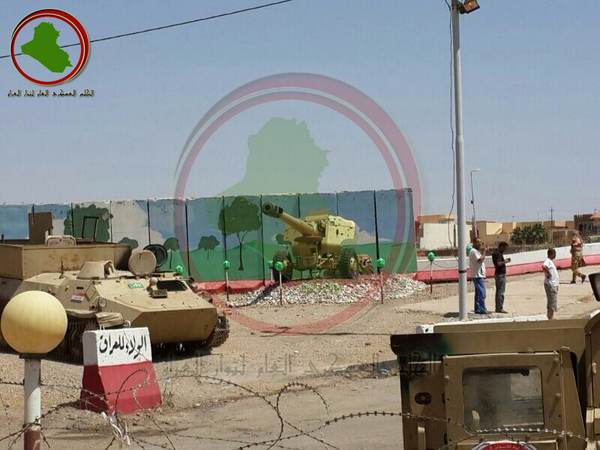 There is a possibility that the eventual arrangement in Mosul may parallel Fallujah, where there is sharing of the city between ISIS and other insurgent groups but as per a virtual agreement on ISIS’ terms, or parallel to the nebulous co-existence between the Assad regime forces and the PYD in Qamishli. Coming back to Saraya al-Madina al-Munawara, it remains to discuss the group’s area of operations. According to the media representative I interviewed, the group does not openly proclaim or advertise many of their operations, but from what can be gathered from published material, it would appear the group primarily operates in Anbar (to be more specific, the wider Fallujah and Ramadi areas), and like other minor insurgent groups its attacks are mostly limited to mortar strikes and hit-and-run style operations. This does not exclude the possibility of their operating in the wider area. 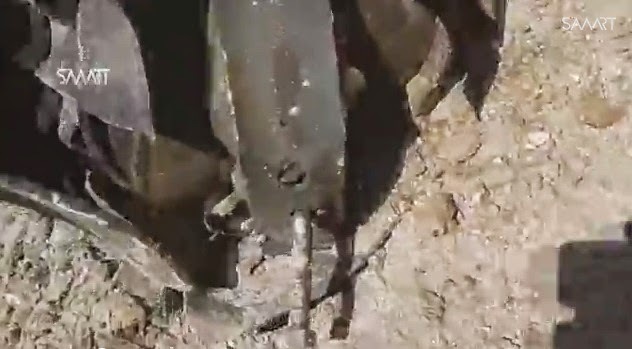 It's unclear if the locals took a closer look at the remains of the unexploded bomb, and they may have (sensibly) decided to leave the huge unexploded bomb alone. 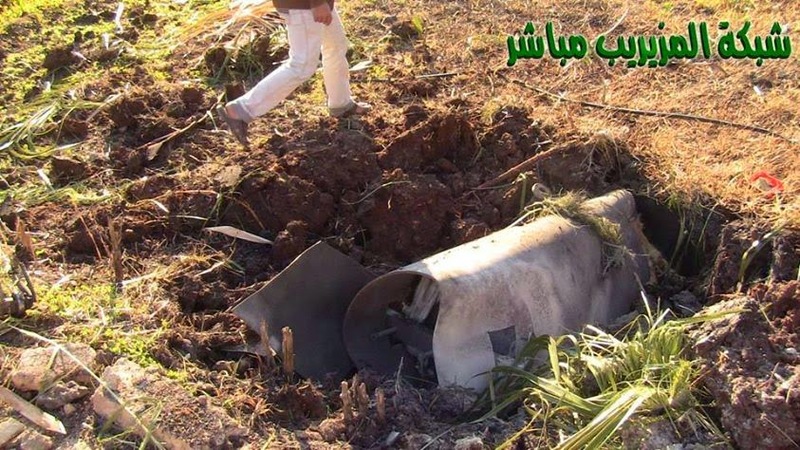 It's described as the remains of an unexploded barrel bomb, nothing too unusual in Syria, but there's something about this example that makes it very interesting. The assumption is the bar was to hold the end of the cylinder away from the ground, so it would have enough room to release the gas contained in the cylinder on impact, with the slots on the side allowing the gas to escape. 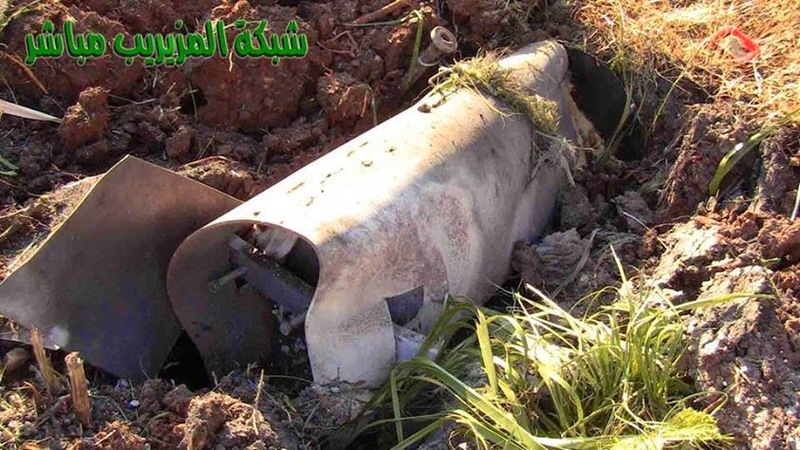 If that's the case, then it seems likely the example from Muzeireeb was also a chemical barrel bomb, used two months before the first attack in Kafr Zita on April 11th, and hundreds of miles away in Daraa. 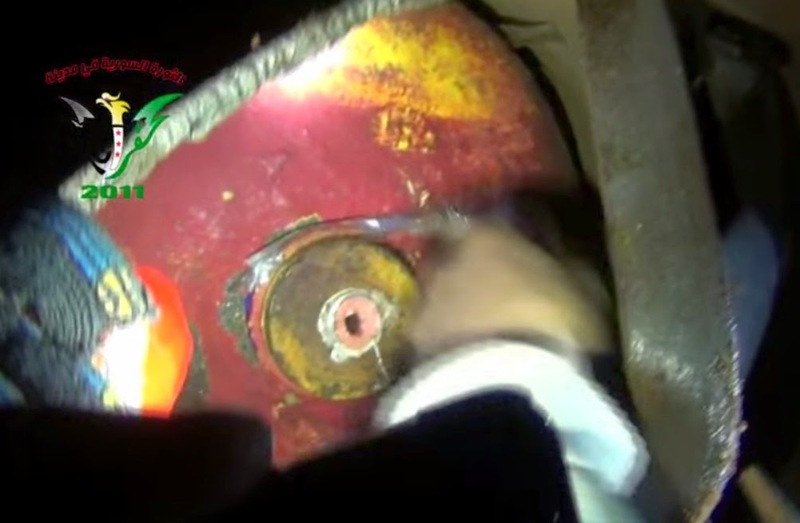 It begs the question whether other reported chemical attacks since (and even before) February were chemical barrel bombs, and how long these have been in use by the Syrian air force. A guest post by Jett Goldsmith. In blogging, expectations are lowered; not only in terms of quality, but in terms of accuracy and professionalism. Plenty of bloggers maintain a standard of quality and accuracy in light of their profession, like Mr. Higgins and the dozens of other remote reporters on the Syrian conflict -- who blur the lines between amateur and professional, and who still manage to break stories sometimes hours before mainstream sources, despite unfavorable odds. But for every journalist who has embraced the massive soapbox of the internet with open arms and an eye for quality reporting, there remain those who choose otherwise; riding on the coattails of legitimacy touted by reliable bloggers, misusing the unquestioning arms of the internet to inject falsehoods, poor research and shoddy journalism into what tries its best to be a proper field. Enter Seymour Hersh. A once-famed investigative journalist noted for exposing the Mỹ Lai Massacre by U.S. troops in Vietnam. Perhaps one of the first true “bloggers” of his time, who chose to work as a contributor rather than a professional staff writer. But unlike today’s bloggers, Higgins and the like included, Hersh never truly adapted to the standard of accuracy which most would expect from a seasoned contributor. His career was frequently tainted by allegations of poor research and dubious sources. Claims he made, while typically taken on faith, had the remarkable tendency to be proven false. And nowhere more egregious were these lapses in credibility than his commentary on the Syrian Civil War. In early April, Hersh released a report entitled “The Red Line and the Rat Line,” which called into question the role of the Syrian government in the devastating August 21st Ghouta chemical attack which killed and injured over 4,000 people, many of them civilians. The popular sentiment was obvious: Intelligence agencies and officials from France, Israel, the United States, Germany, Turkey, the UK, the Arab League and even the independent Human Rights Watch placed blame for the attacks on Assad’s Syrian Arab Army. An independent United Nations report, while failing to directly pin blame (as per its design), heavily supported the conclusion that Assad was responsible. But Hersh refused to sit on the side of credibility. Instead of following the authority and ethos of nearly every accredited world government and human rights organization in existence, he chose the path of conspiracy -- sitting in the company of such bastions of truth and knowledge as Mint Press News, Russia Today and Infowars. Hersh’s main argument is one of denial, interlaced with effrontery and a small touch of paranoia. His claim is straightforward: Jabhat al-Nusra, the al Qaeda-affiliated rebel group, were the true culprits of the August 21st Ghouta attack -- and they were supplied by Turkey’s Prime Minister Recep Erdoğan. Hersh’s argument is debunked and rebutted in CBRN specialist Dan Kaszeta’s “Hersh and the Red Herring,” and in Higgins’ “The Knowledge Gap - Seymour’s Hersh of Cards,” and even in a statement by United States National Security Council spokeswoman Caitlin Hayden -- all of which are unsurprising. In reality, Hersh’s argument is no different than those made by the questionable creatures trolling the depths of the AboveTopSecret forums, or the murky waters of PressTV’s government-fueled newsrooms. They differ in allegations, sure: AboveTopSecret claims the CIA did it; PressTV points at a “US-approved false-flag operation conducted by Saudi Arabia in collusion with Israel;” and the like-minded Seymour Hersh blames Jabhat al-Nusra and Turkey. But their variances in blame are all connected by one factor: the attempted vindication of the Assad regime, and the unabashed embrace of conspiracism, faulty logic and dangerous assumptions to accomplish it. Bashar al-Assad needs no vindication. The Syrian conflict is complex: both sides have committed atrocities, and the lines of morality are becoming increasingly blurred. For many, a rebel victory may not be the best possible scenario for Syria. But to vindicate a brutal, murderous dictator -- one who gasses his own people, executes the systematic torture and murder of detainees, and drops thousands of pounds of explosives on the homes of families, men, women and children -- that is the true crime against humanity. As for Hersh? His credibility erodes at a stunning pace. He is long gone from the days of the Mỹ Lai Massacre, and even further from his brief period of respectability as an investigative journalist. Once heralded amongst the likes of Pulitzer winners and Polk recipients, he lives on amongst those of paranoid pundits and crazed conspiracists. And although serving as a sort of glorified blogger for the tenure of his career, Hersh will never meet the standards of any credible journalist, neither in accuracy nor in quality. His unabashed defense of a regime which has killed thousands of civilians and destroyed the lives of millions more has no place in any legitimate discussion, and it certainly has no place as an accolade under the belt of a once-famed investigative journalist.